Ireland’s first patient received a miniaturised, leadless pacemaker last week. Fitted by Consultant Cardiologist and Electrophysiologist, Dr Jonathan Lyne, the Medtronic Micra Transcatheter pacing system is the world’s smallest pacemaker. It is inserted into the right heart chamber by catheter via the femoral vein in the thigh. It is smaller than a AAA battery. The minimally invasive way of delivery reduces risk and trauma to the patient. If necessary, the Micra can be turned off and a traditional system or upgrade can be implanted or it can be retrieved to enable acute retrieval. The 82 year-old patient, Mr Peter Cassells commented: “The whole thing was easier than going for a hair cut. I was sedated but I was still fully alert and able to watch the whole process on the screen as it happened. It was fascinating”. Dr. Jonathan Lyne is the only consultant in Ireland who is trained in the delivery of the Medtronic Micra Transcatheter Pacing System. He commented: “One of the biggest issues for the users of pacemakers is erosion where, over time, the older pacemakers need to be completely removed as they slip, become more visible under the skin, more uncomfortable and in some cases, can cause infection. Also, the leads can cause blockages in the veins. The size, location and leadless nature of the Micra are designed to eliminate these complications”. 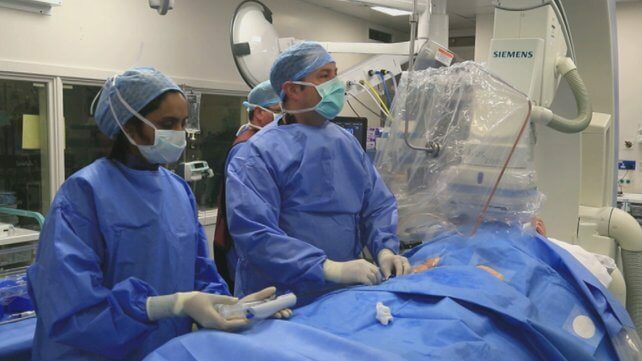 “After the success of this procedure, it would be hoped that soon, the Micra will be the norm for pacemakers in appropriate patients,” he added. Dublin man fitted with world’s smallest pacemaker – RTE News.